I feel extraordinarily lucky to live in the beautiful Sydney suburb of Mosman. We have, by my admittedly not very scientific calculations, around 15 kilometres of harbour frontage, six idyllic sandy beaches, 29 parks and reserves as well as incredible views of the heads, opera house and harbour bridge. And all this, just four kilometres by ferry from the city. The only snag is, everyone else wants to live here too. 27,000 of us in fact. Which means property sizes are, on the whole, small and unless you are lucky (or house hunt by garden, rather than bricks and mortar, as some of us do) it’s pretty hard to create a proper oasis here. You know, a secluded, green, peaceful sanctuary where you forget about everything else in the world. Even if you do have privacy and more than a couple of metres between the house and fence line, you soon discover the perils of our terribly thin, shallow, sandy soil. All the theories I had learnt of infrequent, deep watering very quickly went out of the window, along with most of the plants I had brought from my clay soiled garden in the much drier Canberra. Fortunately, there’s always one clever soul who shows us just how it to do it. And in Mosman, that man is Mark Paul. Boy, does he do gardens well. As unassuming and humble as they come (I was going to warm to him instantly), Mark understands his environment as if it were a part of him. His thirty years in the landscaping industry, running ‘The Greenwall Company’, has clearly taught him a thing or two, but Mark’s passion, for plants and for the environment, are really something else. This is a man so in tune with his surroundings you feel he must have some kind of sixth sense. So it might surprise you that he bought a house on a site with a sandstone base and exactly zero millimetres of soil. Can you imagine? But, hey, this was no barrier for Mark. He built six very large planters , created green walls and green roofs, built up an average 20 centimetre soil depth where he wanted plantings and then picked exactly the right plants. Who would have thought you could grow bananas on such a dry site? And so despite it being a fairly average 750 square metre plot, Mark has developed an oasis to match the very best country estate. He’s got vegetable gardens, chickens, fish and tadpoles, alongside the most stunning, perfect, sophisticated seating areas. He’s got play areas for his children, utility areas for composting, wetlands, drylands, a swimming pool and everything in between. Well, through two broad mechanisms. The first is through taking an holistic viewpoint. Every aspect of the house and garden seems to interact with every other aspect. The trampoline provides shady cover for the chicken run; the roof collects water for the roof plants, green wall, to top up the pond and then be stored under the house; prunings are all mulched on site and used to keep moisture in the soil; chickens eat kitchen waste; carp eat mosquito larvae; water plants are cut back to balance nutrients in the system; and piping under the house preserve the natural flow of water over the block. Everything is considered and balanced in a way that allows an equilibrium to form. Ecodesign is all very well but can seem like an expensive, inconvenient or high maintenance way of living. When it’s done well, it’s exactly the opposite. I find the idea of natural cycling of materials within an urban property enormously exciting. Each Wednesday morning our road is full of overflowing, huge, 240 litre bins of rubbish. Each household filling two or three every week. It’s obscene when you think about it. How can we be buying so much that we throw away 500 litres of rubbish every week? Some of the 240 species that adorn the roof of Mark’s house. I really needed a pair of wings to take in the rest of it! I was a very late adopter of recycling; it was 2006 before I did any at all. But I’ve always hated inefficiency and wastage and now sustainable ways of living, that are both sustainable for the environment and sustainable as a realistic, day to day, way of living, feel so right to me. These closed loop systems so clever and neat. But before I start tying myself to trees, I’ll finish the story. There was a second mechanism I mentioned. And that’s the one of picking the right plants. Mark has learnt which plants actually thrive in shallow, fast draining soil and built the garden around them. He has exotics and natives, trees and ground covers; names and nationalities are no problem, it’s how they grow that he is concerned with. And, incredibly, he has found 240 species that thrive on that very hot green roof alone. I wrote a post a while back on my frustration with green walls being marketed as a quick and easy way for non-gardening types to soften apartment balconies and the like. Well, Mark Paul has totally won me around to green walls. You do need specialist skills and equipment to set one up that will endure, I still despair of the online marketing, but with the knowledge that Mark has, they can be both stunning and sustainable. I’d naturally pick a low growing, soft, able-to-be-trampled-on-a-little plant to fill in between two paths, but how great do these Bromeliads look? Mark’s company motto is ‘Reclaiming the built environment’. He shows us the way to reclaim an oasis in the smallest of city spaces. He really is pure genius. 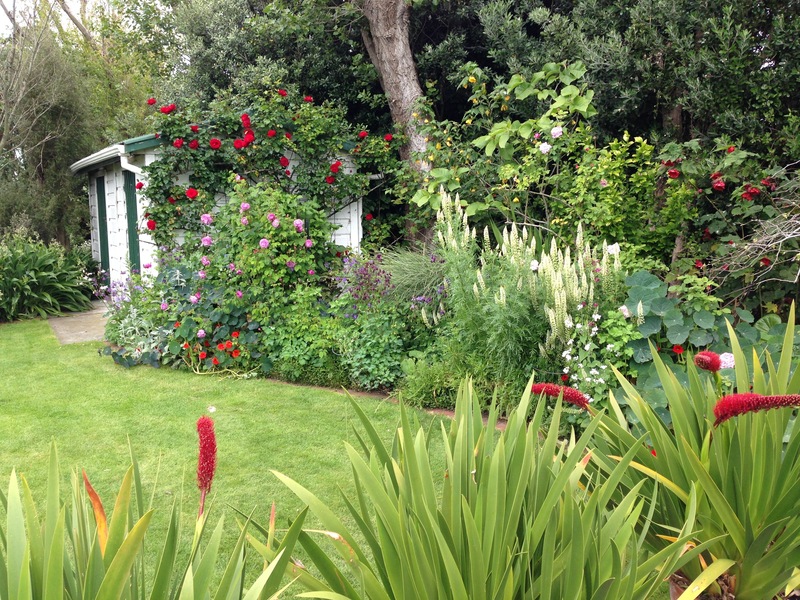 What a great garden Paul has created Janna – he seems to adhere to the principles of permaculture to an extent too. I have been thinking about one small green wall in a spot to screen our large ugly green shed from being viewed from the house and yes I too have thought it would be hard to make work. Knowing the the horticulture has to be right. Given the right species though – tough and resilient – we could all have a go! Thanks for sharing Paul’s inspirational garden. Yes, very stylish permaculture! The theory is always great but it’s wonderful to see it applied with such outstanding design ideas; the two don’t always go hand in hand. Good luck with your shed wall. Wow, what a beautiful garden… and some very clever and inspiratonal ideas. Certainly something to aspire to. There are flavours of a certain Marsh garden here, too! You have the upper hand of time though; there is nothing that beats a garden that has come together over a number of decades. Glad if you did get some ideas though; it certainly is inspiring. 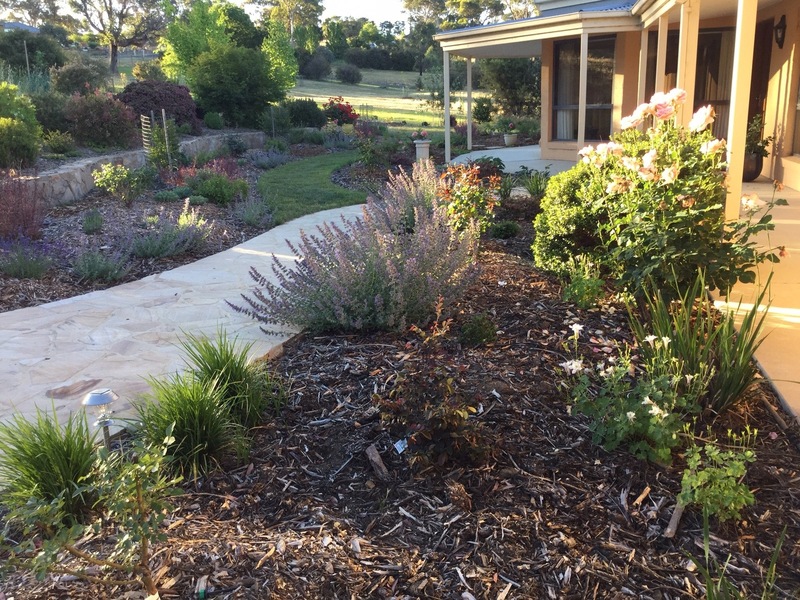 Funnily enough, before I started reading your blog and discovered the diversity that exists, this is how I thought all Australian gardens would look: packed full of exotic and ‘tender’ plants that just wouldn’t survive for me. Given the lack of soil though, it’s amazing. Australia is indeed diverse and in fact ‘extreme’ is the only single adjective that describes its weather. Some areas, believe it or not, have year round snow, others, incredible wet seasons and then, of course, we have vast expanses of desert. Pick up an ‘Australian gardening’ book and it will tell you almost nothing. Overcoming the lack of soil in this garden is incredible, but then Mark probably doesn’t have to deal with precipitous banks, deer, mice or your favourite of all, SLUGS! What an out of the box thinker! Amazing what you can create in such a space. It must be lovely to look out from the house and see this wonderful garden. I would love to be able to look out from the many windows in my place and see such lush garden instead of a fence or a neighbours brick wall. I suppose I need to be patient and come up with some other ways to achieve that. Thanks for another great blog Janna. Yes, Louise, it’s so invigorating to see someone tackle something so head on and succeed so strongly! I’d love that green look from all my windows too. We’ve got it to a large extent here, but I fear London may be a totally different matter. Perhaps I need to do more thinking out of the box when I get there!